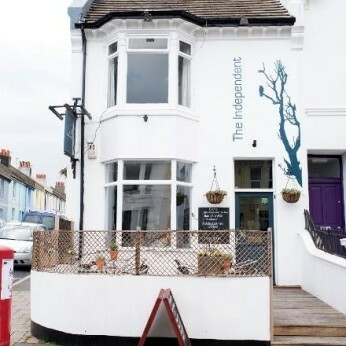 As we are free of any brewery, pub chain or tie, The Independent is a true freehouse pub in the Hanover/Queens Park area of Brighton. As a freehouse, we are able to offer a more exciting choice of beers, wines and spirits. Currently we have four real ales alongside 12 keg beers, but these change weekly so we recommend popping by to see what’s new on the bar! A few of our past and present beers can be found here. Our delicious menu mixes traditional British dishes with Mediterranean and other European flavours, including tasty vegetarian options. Everything is freshly prepared by our chef and made from the finest ingredients, and our menu changes daily – you can see a typical menu here. And of course come Sunday, we serve a full meat and vegetarian roast menu. We welcome dogs just as warmly as their owners, and we’re open every day of the week! We look forward to seeing you soon. We're really sorry but we don’t seem to have any offers or events for Independent. We're sure there must be something happening here but they just haven't told us about it! Please do mention this to Independent when you next visit them.